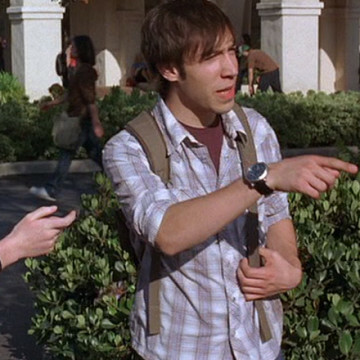 Believe it or not, that isn’t Justin Long playing the part of the dude who greets Turtle on campus in S06E06, Murphy’s Lie. It’s Creagen Dow, and he also plays Jeremiah Trottman in Zoey 101 and Jerry Vaughn in the small French film Hamlet’s Ghost. Creagen makes his quick Entourage debut (and exit) right at the episode’s halfway point.